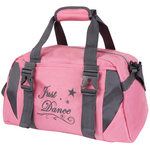 Make your girl an all out dancing diva with kilofly Girl's Dance Bag. This lovely designed bag has a lot of storage space inside its main compartment. This bag has 1 internal zipped pocket, 1 front zipped pocket, and 2 side compartments one on each end, providing an easy way to organize towels, socks, brushes and other items. 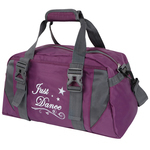 This surely makes a great bag for dance practices or girl sleepovers.